Over the last 2 weeks Marlow Thames Rotary Club have been busy finalising the distribution of funds to charities. Most of the money has been raised from various high-profile events – including the Cookham Regatta and the Marlow Santas Fun Run, (which are organised in conjunction with other local Rotary clubs). A record 21 charities and good causes have benefited this year and over £30,000 distributed. And on top of that the club recently collected another £1,800 for Comic Relief through just a 2 hour collection on Marlow Bridge. On Wednesday night Andy Lewis MBE – Paratriathlon Gold Medal winner at the Rio Olympics – gave an inspiring talk to Rotary Club members, and discussed his support for the Arctic One charity. Amongst other things Arctic One provides grants to children seeking specialist equipment to compete in para events, and Andy is an Ambassador for this work. This is just one of the charities receiving funds from Rotary. On the previous Wednesday Marlow Thames Rotary Club President Dermot Kelly hosted the annual Charity Awards Dinner at Flackwell Heath Golf Club, when the distribution of over £30,000 was completed. Many charities were represented, and various sums have recently been distributed to Arctic One, Marlow Opportunity Playgroup, Rennie Grove Hospice Care, Wycombe Homeless Connection, One Can Trust, Thames Valley Air Ambulance, Headway South Bucks, Sepsis Trust, Shelter Box, Aqua Box, Horizon Sports, Sparkles, Friends of Forest Bridge School, REMAP, BucksVision, Wycombe Talking Newspaper, Parkinson’s Society, Macmillan Cancer Support, and Stillbirth and Neonatal Care. More funds will be used to support other initiatives throughout 2019. 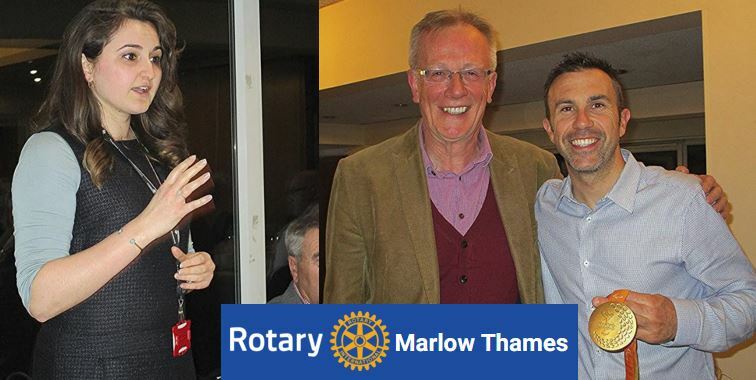 He added: “The people of Marlow and South Bucks are very generous in supporting Rotary led events. We just want them to know that we work equally hard at ensuring the money ends up in the right place – and I think this year’s charity distribution demonstrates that very well indeed”.